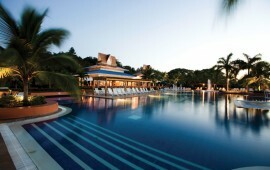 Royal Decameron Beach Resort, Golf, Spa, & Casino Panama offers a traditional All Inclusive experience and more. Located on 2 kilometers of secluded white sand beach, Royal Decameron boasts six large pools, 11 restaurants (8 a-la-carte), and 11 bars (including 1 swim up bar), all surrounded by lush gardens on a hill overlooking the Pacific ocean. When not relaxing on the beach or in our spa, we invite you to play a round on our on-site 18 hole golf course; take part in our many organized activities, from volleyball to water aerobics; take advantage of our many free non-motorized water-sports options; or tour the sites of Panama with our on-site tour group, Decameron Explorer. At night, you can eat in one of our 8 specialty restaurants while your children enjoy the nightly kids show. After dinner, take in the sites and sounds of Panama at our nightly show (see a different show every night for two weeks). Finally, you can play in our casino and dance the night away at our discothèque before retiring to your well appointed, comfortable guestroom. Royal Decameron Beach Resort, Golf, Spa, & Casino Panama truly offers everything and more necessary to make your trip a fantastic experience. Prices are per person, based on double occupancy. Prices do not include airport fees and departure taxes, The airfare portion of the itinerary price is based on midweek departure. Airport fees and surcharges vary by departure city and destination. Airport fees can add up to $150 to the total package price. Prices will vary according to departure cities and travel dates. Air fares are subject to change without any previous notice. This “tentative online itinerary” serves only as a price guide as all prices are subject to availability and prevailing rates at the time of confirmation and payment.